Over the last couple of weeks, some events happened that really bring to my mind the uniqueness of our faith community. 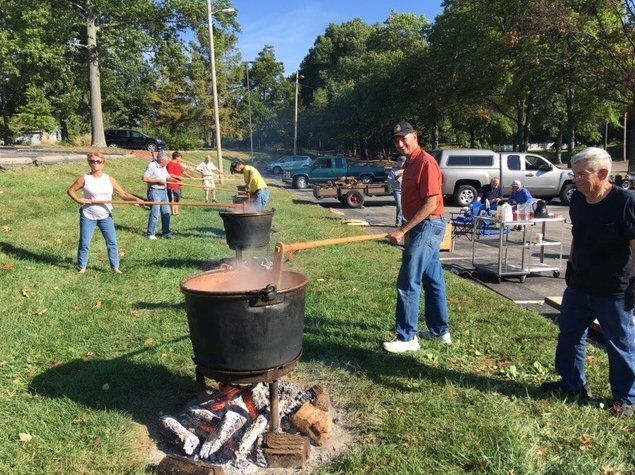 We had Apple Butter Days, an event that’s been going on for 60 years. We also had a Greeting Card Ministry celebration, that’s been going on for 20 years (producing 32,000 cards in the process!). These are two hallowed traditions of our church. You can name many more that reflect the faithfulness and vision of our members from generations past. Then, the weekend before those two events, we held our Fall Festival, with 785 folks from church and community coming together to provide a unique experience for community families. This is a relatively new event, that came from the dreaming of our Children and Family Ministries area. What struck me is that this reflects what the church is about. We are always discerning new ways of reaching out and connecting people. It’s simply in our DNA. Add to the list such things as our “Shared Streets” initiative in reaching out to young adults, and you’ll get the picture. Truly, ministry here is “Unfinished,” a fitting theme for our two-year stewardship initiative. As you pray for and support our ministries, keep in mind the faces you see in the above pictures. What an exciting place this is! Remember that this is a great opportunity for prayer, devotion, and fellowship! Each week, we’ll hear a story from a staff/church member, as well as have an opportunity to lift up people/concerns in prayer. Sharing his story with us this week is Chris Thomas, a business professor at St. Louis University. Anyone interested in an Early Response Team deployment to assist victims of hurricanes Florence and Michael should attend this important discussion. Possible deployments are to North Carolina, South Carolina, Georgia, and Florida. Deployments are for one week; you may sign up for more than one. You do not have to be ERT certified. We need all skill levels. More info: contact John Himpel at 314-541-1727. My sermons in October look at how our church can model the early Christian community. That community intentionally provided a way for Christians to share so that no one had any need—what a wonderful goal! My sermon will be based on Acts 4:31-35. This year, we are part of a cluster Charge Conference. While we will fulfill approval of reports, the emphasis will be upon training, led by Rev. Roger Ross, Director of the Center for Congregational Excellence. All members are welcome. Voting members are the Leadership Board and retired clergy whose Charge Conference is at Manchester UMC.